Calico Junction New Beginnings Ranch Equine Therapy and Troubled Teens - Calico Junction New Beginnings Ranch, Inc. Many schools offer residential treatment for troubled teens, but few offer daily equine therapy programs such as ours as a means to healing many of the common social, and behavioral disorders that exist in many teens today. The leading new treatment involves Equine Assisted Therapy. Horses are the first choice for therapy programs because a horse will mirror a person’s feelings, reactions and attitudes to perfection. Many studies have been done to show the effects of building relationships with animals and horses. Endorphins are released into the body and decrease chemicals which cause stress and arousal when sessions with horses are experienced by troubled youth. Troubled teens are typically in a state of aggression, defiance, or anger. Using horse therapy with these teens helps maintain a constant and healthy chemical balance. Horses cannot speak like humans, and careful attention must be placed on their body language. They will let you know if they are nervous, relaxed, frustrated, exited, or dangerous by their body language. Learning how to recognize this language is key in learning how to train and become one with a horse. Horses have been used for therapy for many centuries. Many disabled people both physically and mentally have used horses to overcome their obstacles. More recently, horses are being used for troubled teens. The principles are the same. Teens who may struggle in school, have alcohol or substance abuse problems, or have social or mental disorders can greatly benefit from horse therapy programs. Not only do horses provide therapy as a result of emotional connection between the human and horse, they also provide troubled youth with an opportunity to learn how to control and work with animals. Learning how to work with horses will help them in their day-to-day lives as they deal and work with humans. Horses can often times be stubborn, reluctant to follow orders, and have to learn how to get along with a team. 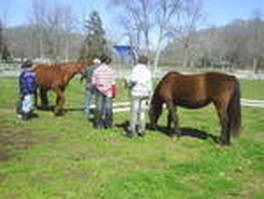 Members of horse therapy groups will learn how to properly lead, groom, and take care of the animals. These teens may realize that they exhibit some of the exact same behaviors as the horse. By learning how to get along and work with the horse they will better understand their own emotions and body language.